Every business owner knows the importance of good communication between you and your staff members, as well as with the client and customer. That all starts with the right telephone infrastructure, so that calls can be made seamlessly with no technical interruptions. Furthermore, is the issue of cost. As the business owner you want the freedom so that there are no limitations on who, when and where calls can be made. The solution for more and more businesses in relation to all of this is the virtual phone system. However, with so many services currently on the market it can be difficult to know which to opt for. To help you, we recently published a top 5 review round up. This gave in depth details on some of the current market leaders. Check out our top pick virtual phone provider for 2018 here! For those that would like to do more of their own research, we have come up with the following 7 handy tips to consider when looking to purchase a virtual phone system. 1. Whether to choose VoIP or VPBX? Voice over Internet Protocol (VoIP) is a popular alternative to traditional phone systems. The nature of the system is all the title. Instead of using traditional telephone infrastructure, (i.e the Public Switched Telephone Network (PSTN)) you are making the call over a standard internet connection. Skype is the most well known VoIP software platform. However, newcomers such as WhatsApp, Viber and Apple’s FaceTime utilize the same technology to connect you. VoIP is clearly highly cost effective, (most services are free) however both you and your recipient have to be connected to the internet for the call to be made. Virtual private branch exchange systems utilise both internet connectivity as well as the PSTN. However, the biggest difference between VPBX systems and your traditional phone systems is that there is no need for any new hardware or new phones for the office. A VPBX system is entirely virtual. Your existing office phones, (hard lines and/or mobile) can quickly be set up to the virtual system, with all calls being routed through it. In fact, many VPBX systems are designed specifically for small business. They help reduce costs, while having far better reliability than the many free VoIP systems. The best virtual phone providers will have packages and tariffs to suit all business types and needs. Shop around to find out which service is better tailored to the demands of your company. For instance, in 2018 Nextiva are getting good reviews for the services they are providing for small business and startups. No business wants to suffer downtime of communications while an unnecessarily complicated virtual phone system is set up. Your business also doesn’t want inturreptions due to technical issues. When looking to sign up to a service you will want to look for a company with a good reputation for an easy to use and reliable system. Again, our two top picks Virtual PBX and AxVoice have excellent reputations in this regard. Grasshopper are another popular choice. If you have different aspects of your business that would benefit from being accessed via an extension of your main telephone number, you will want to ensure that the company you use can provide this feature. This is done by adding a short number after your main business number. Specific departments or staff members can then be reached without the need for a receptionist having to transfer calls. Even if you do not need such features from the start, it is good to know that you have the option in the future. 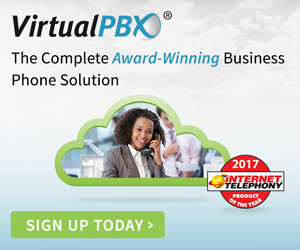 Again, the larger service providers such as our top pick, Virtual PBX, offer unlimited extensions in their package deals. A quality VPBX system will have a fool proof disaster recovery system in place. If your business experiences a flood, earthquake or some other debilitating situation, your office might have to shut up shop on the premises, but your phone system will continue to work unscathed. For this the service provider will initiate your recovery plan. This includes reliable data backup system that will keep all the records safe in the event of such disruption. If you are signing up to a service for the long haul you will want to ensure that they have good customer service should you ever need help. In other words, how easy are they to contact when you need them? You want the option of having representatives at your disposal 24/7 – you never know when things might go down and in business time is obviously money. The longer you are unreachable, the more it will cost you. Look for providers that can offer you an affordable package that will cover the amount of minutes you will need. Unlimited packages are obviously fantastic if they are at the right price. Pay pay-per-minute plans suit businesses that only use calls sparingly. If your business does not want to be hindered in the amount of calls it makes, unlimited is definitely the way to go.